We have an exciting period of fun filled events leading up to the move in. Moving time again. Please let us know if you can lend a hand. Music Concert--discussions are in the advanced stages with a number of muscian friends of Richies including Pete Murray. 15th of June Bangalow A&I Hall--Peter Fitzsimons and Nick Farr-Jones-Lunch- More information click here. 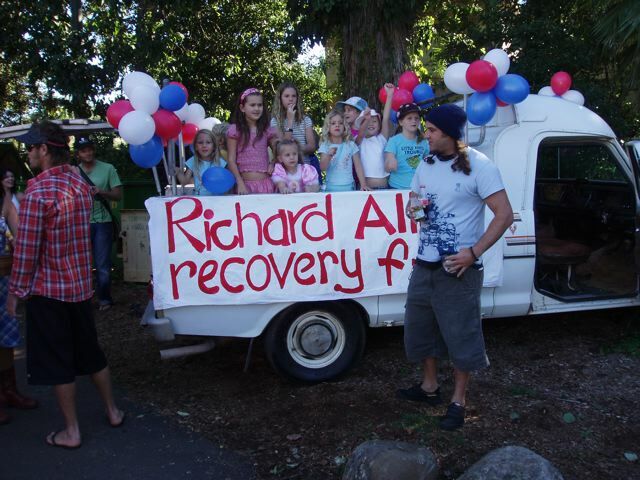 Our first Fund Raising Event held for Richard on Saturday April 28th at the Bangalow Hotel was a huge success. Thanks to everyone who attended, donated prizes and of course bid at the auction. A large sum was raised and more infomation and specific thank yous will follow. Over the weekend a number of Rugby Clubs raised money for Richie. LIsmore Rugby have collected just under $1,000 principally from gate collections and a raffle. In addition our Fishing Friends from Iluka have donated a huge seafood tray which will be available at an upcoming auction.